Take a beautiful walk through open stands of Jeffrey pines and black oaks and enjoy viewing at a 900-acre wet meadow with two seasonal lakes that attract migratory shorebirds and waterfowl. Background: Enjoy spectacular spring wildflower displays of lupine (Lupinus excubitus var. austromontanus), tidy tips (Layia platyglossa var. campestris), and cream-cups (Platystemon californicus). In the summer, scarlet penstemon (Penstemon centranthifolius) blooms give way to vivid fall colors among the oaks. Wildlife watchers will enjoy seeing ash-throated flycatchers, pygmy nuthatches, acorn woodpeckers, and Steller's jays. The lakes attract migratory shorebirds and waterfowl. Wildlife and Where to Find It: Fall grasses conceal resting mule deer. Ash-throated flycatchers, solitary vireos, and white-headed woodpeckers perch in pines near the meadow edge, an area favored by bobcats and ringtails. 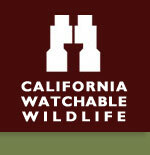 The oak woodlands shelter mountain quail, Cooper's hawks and many reptile species. Tree cavities hide flammulated owls and purple martins. Enjoy spectacular spring wildflower displays. Summer scarlet penstemon blooms give way to vivid fall colors among the oaks. Viewing Tips: Birdwatching is excellent year-round, with peak activity during the spring and fall. Meadow wildflowers peak in May and June; penstemon blooms during July and August. Fall colors best in October. Site Notes: Wildflower viewing is best in May and June along the byway and in Laguna Meadow next to the Big Laguna Trail and Laguna Campground. A Forest Service Adventure Pass is required for all parked vehicles. Adventure Passes can be purchased at the Forest Service office in Alpine 7 days a week. How to Get There: From San Diego, take Highway 8 east approximately 40 miles to Sunrise Highway exit. Turn north and continue 12 miles to the Penny Pines sign a rock-walled turnout on the east side of the highway. Park here, cross to the west side of the highway, and hike the Noble Canyon Trail approximately 0.25 mile. At the trail junction, take the Big Laguna Trail southwest for 4 miles. Reverse directions to return to the trail head. Directions from Mt. Laguna, CA: The trail is accessed from Laguna Campground or Penny Pines parking area along Sunrise Scenic Byway.